I've admitted to this before - I love the look of fish. Not enough to have one in a tank but if I did, I'd really want this fellow. His name is Strawberry and he's a four year old Giant Gourami, still growing. He loves to eat strawberries, hence the name. He lives in a large tank in a local plant nursery and is quite sociable, peering through the tank at visitors and scaring the daylights out of small children when he opens his huge mouth up against the glass. I couldn't find an image of a Giant Gourami eating a strawberry but here's one eating a tomato. 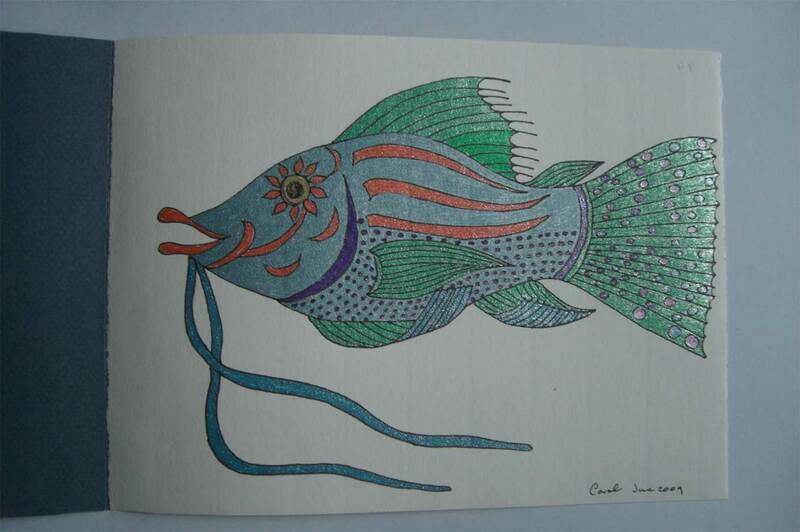 Drawing fish is a very unscientific activity for me. They sometimes start with a touch of fact but they go off into fantasy quite quickly. 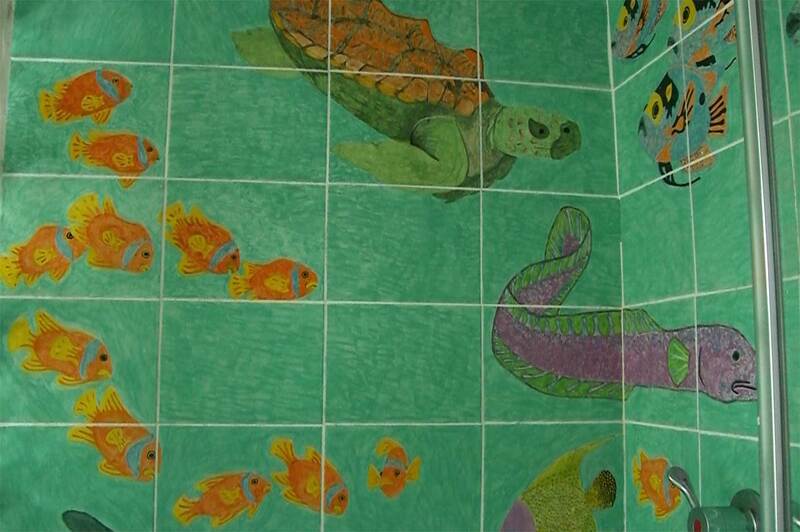 I took the fish fantasy to great lengths when I tiled my shower with hand painted sea life tiles, made by my daughter Suzy Spoon. I was pretty sad to leave these tiles behind when I moved to the Central Coast, especially as Suzy has moved on in her artistic career, now working in film and TV. Suzy Spoon’s web program Iron Deficient Chef has been chosen as a finalist in the Voiceless People’s Choice Awards 2010. We need your vote to help Suzy win. Voting closes on 20 September. Iron Deficient Chef, series two – SpoonCapers : a series of five-minute webisodes each containing a delicious vegan recipe and an important animal protection message. After a successful series of six five-minute webisodes in 2008, SpoonCapers is ready to begin producing series two of the popular vegan cooking show, Iron Deficient Chef. Each episode deals with a different ethical issue associated with what we eat – from the growth of the factory farming industry to the commercial kangaroo slaughter, live export and pigs in sow stalls, as well as providing the viewer with a delicious vegan recipe. “Iron Deficient Chef makes viewers aware of important issues about animal cruelty, and is delivered in a non-confronting way to maximize its appeal and reach a new audience,” notes producer, writer and host Suzy Spoon. Voiceless is an independent non-profit think tank dedicated to alleviating the suffering of animals in Australia. Voiceless envisions a world in which animals are treated with respect and compassion. The annual Voiceless Grants Program has seen over $1 million given to organisations for inspirational animal protection activities over the past six years. The People’s Choice! Award is your chance to be part of Voiceless’s work in funding projects that help animals in Australia. This $10,000 grant, awarded to the project which receives the most public votes, is funded by public donations throughout the year. Now in its fourth year, the People’s Choice! Award is your chance to have a say in what we do. To vote for Suzy’s Iron Deficient Chef, please go to the voting page, highlight the 4th button : Series of vegan cooking/animal protection webisodes. You will receive a validation email. Please don’t forget to validate this to make your vote count. I love your fish indulgences, the strawberry named (and eater) included! I wish your daughter the best of luck! Her project sounds wonderful and it did get my vote! Anna: Thanks for voting for Suzy. Fingers crossed. Ronnie: Yes, nice fish, though I always feel I'd like to set him/her free. I can just picture a fish of that size terrorising a neighbourhood that has a creek running through it. The vegan doesn't eat fish though I do occasionally. Wow! that's an amazing shower. I don't know if I could have left it. That's why I've always resisted the urge to make something "built-in" with my ceramics. 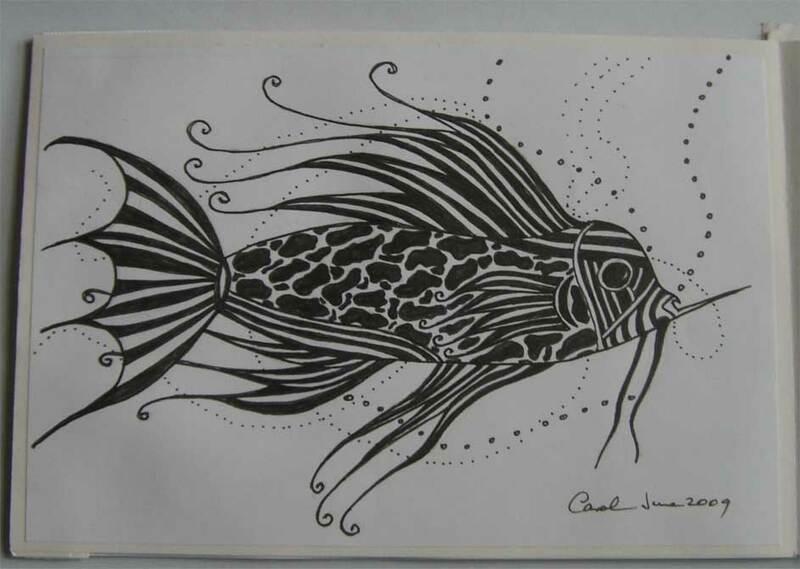 I love fish too and used to have a tank, many,many years ago. Now I have the small pond that was my mother's with the 2 goldfish. It's a lot easier to look after than the tank was. A fish eating strawberries, at first I thought this was a post about a fish restaurant! The sort they have in Japan where you pick your fish course from the tank. Amanda: If I ever have a fish again it will be an axolotl. 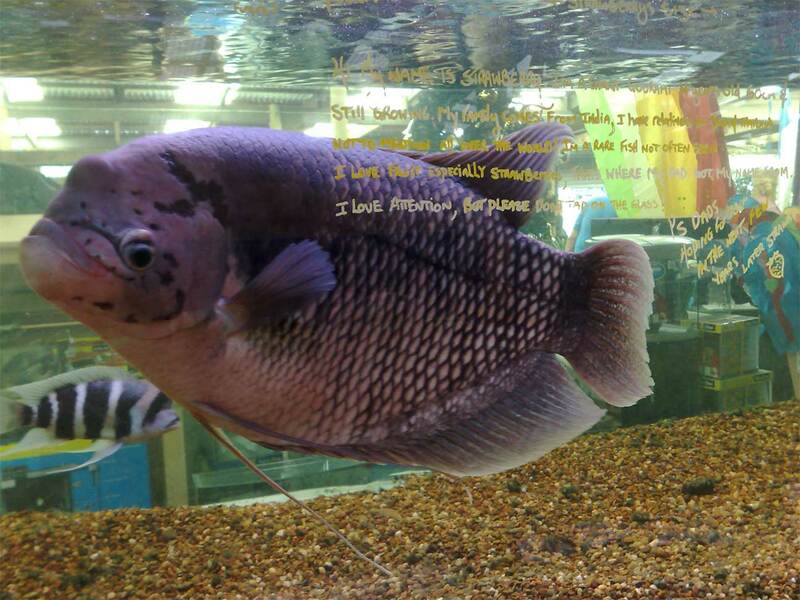 Acornmoon: Many of our Chinese restaurants in Australia have tanks where you choose your fish. I try to avoid these. Ooh! 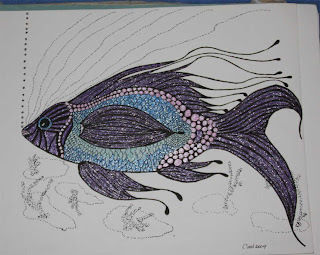 More glittery fishes.We had a Cosby that like raisins.And a male Betta that had to be hand-fed cos he was such a wimp the others stole all the food. I am a little bit afraid of fish, and would probably be in a row with the kids who get scared. At the same time - maybe because I am a little scared - I find them totally fascinating. Your fish images look great! 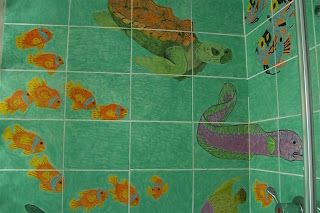 I enjoyed this post about you wonderful strawberry eating fish, I love it, and for your daughters work, I would have been chipping the tiles off. I have been to the Voiceless Awards and voted for your daughter, please pass on my best wishes, I do hope she wins. We recently had a meat free Monday campagin over here... Here is the web address, take a look its very good. I have never had fish s pets but it could happen yet!!! 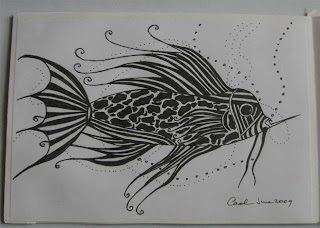 I dolove you rfish drawings and passion fo rthem.